I can blame my middle school bus route past the import auto shop for the recent deluge of Alfa in my life. Our dad's 73 BMW 3.0 CS sometimes sat outside of the shop there, so in between sightings of the classic E9 coupe began a steady exposure to Alfa Romeo. It's necessary to note that the school bus never broke down, which at that point would have been the only opportunity, short of breaking down in an Alfa, for me to associate Alfas with a disregard for forward progress. Things got even better when my dad informed us of his past exploits in a Milano Verde. 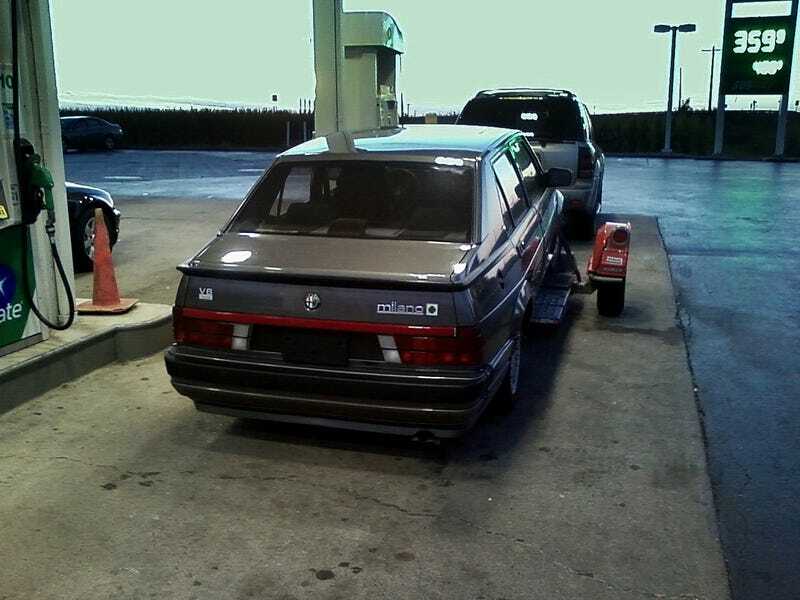 Apparently, when he and our mom returned from living in Germany in the late 80s, they test drove a Milano Verde. Well, they had only been home for a few weeks at the time, so while the Autobahns were a few thousand miles away, their driving style had not yet adapted to life back on the interstates; they ended up scaring the seller. This past summer, I started to notice that my e30 318is was not as frugal to keep on the road as I had hoped. Moreover, I didn't really love the car. My dad and I enjoyed our jaunt through the Rockies required to retrieve the car from Albuquerque, NM, and I still adore the 318is model, but the transaction left me disappointed. That 1,500 mile shakedown revealed some irksome flaws that would have required investing a significant percentage of the purchase price to correct. So, I put the car up for sale and set out to buy a car that I wouldn't mind spending some money on. Something that could evoke a passion to eschew sensibility for intensity. Something I'd enjoy writing about, even. And it would be my daily driver. A M-B 190E 2.3-16 was the first car taken into consideration. A non-running example in decent shape was sitting on Ebay for around $3,000 and I figured I could get into daily driver condition with a little bit of time and not too much money. It was covered in sap, and I don't know how paint works, so I avoided it. Then, I thought about challenging the notion of unreliability in Italian cars - I'd look for an inexpensive Ferrari to drive to work everyday. The cheapest Ferraris are Mondials, which often show up on lists of "worst cars" on the internet. Researching the subject a bit, I realized that Mondials are barely less sporting than the shorter wheelbase 308, and as far as Ferraris go, they aren't that difficult or expensive to service – as long as you do the work yourself. But, I ended up nixing the Ferrari idea as well, because if I'm going to spend $15,000 on a single vehicle, it's going to be something much nicer than a Ferrari. Eventually – no, two days later – I narrowed down the search to include any V6 Alfa, so a GTV6 or a Milano. Actually, just the Milano, for the sake of practicality. And, it had been on my short list since middle school. Searching through AlfaBB classifieds, I understood that I would need to act quickly when I found a car worth buying. I responded to an ad for a grey Verde in Atlanta with recent maintenance and no mechanical or cosmetic issues, other than worn seats. It had previously been featured on Bringatrailer and Classic Italian Cars For Sale, so I knew it was worth investigating. I settled on a price and bought a one-way ticket to Atlanta, GA to bring the car home. Friday after work, I took a plane to Atlanta, where I met my friend Andrew K, an unfortunately young Rose-Hulman student afflicted seriously by Fiat. His dad flies commercial, so he's able to take advantage of free one-way flights to new cars, or sometimes pointless round-trip flights when cars don't check out so well. One year prior we had done an 800 mile trip in my GTI to pick up his Fiat X1/9, so he was glad to come along for the drive, even if that meant arriving at 10PM and driving through the night to reach Indiana. The car made it home from Atlanta with no issues, save for some occasional sputtering that felt fuel-related. Once home, I cleaned the AFM and had Malhon help with a fuel filter. All of the Blyth siblings were in Indiana for the weekend, and we drove to Indy to pick up Anna in the Verde. On the way back, the clutch pedal went to the floor. After a few pumps, it did its job, so we took a small risk and chose the spirited route home. The clutch pedal finally gave up at a stop sign 4 miles from my apartment. With all 4 Blyth siblings, and one extraordinary cousin pushing, I prepared to drop the car from neutral into second to limp the car home. Once in second, I slid wantonly into my intended path, and gulped as I processed the challenging task ahead of me: I had to make it through six traffic lights without stopping in order to get home without a tow truck. Second gear, when attached to a Busso V6, is entertaining. And I made it home that time. The next trip planned was the 600 mile stretch from Indiana to our parents' place in York, PA. You know, to show of the car to my dad! Three hundred miles in, we stopped for fuel, where I checked and blessed the oil level. Ten miles later, the engine started to sound slightly agricultural, and by the time I had the stereo turned down and the window open to listen, I'd lost power and had to pull over. Not expecting it to be catastrophic bottom-end failure (it was), I checked the fuel pump, but it was fine. I had the car towed to the next exit, where my girlfriend and I spent the night. Her friend lived in Pittsburgh, and graciously made the trip to us in Eastern Ohio, then even lent us a car to take the rest of the way. From Graham, BlythBro #2 on BlythBros. For more stories about life with our 84 GTI, 88 911, 87 2.3-16, Alfa Milano Verde, Alfa 164LS, e30s, and more, check out the BlythBros. Blog We promise not to be too bitter. Sort of.